Following your Calvo de Mora combination [above] What are your general guidelines to wearing a black necktie? Most of the time I see it paired with the classic ensemble of white shirt with a grey jacket/grey suit. Any other combinations? Worn with consideration, a black woven necktie can be almost as versatile as navy. It is dark, conservative and professional; if there are any risks, they are excess contrast or a touch of dullness if there is a lack of variation elsewhere. Let’s start with the benefits. 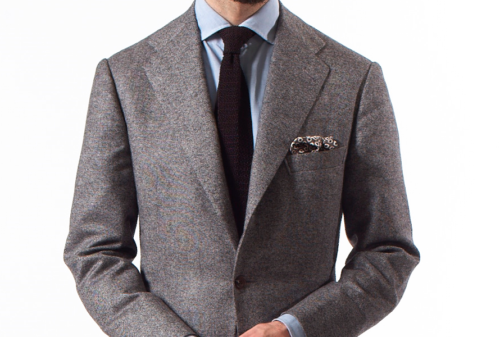 A plain, dark tie provides a base for an outfit, a pivot about which the rest of the ensemble can turn. Navy is the most versatile option, and a navy grenadine is particularly good at bridging formal and informal – it’s the only piece of clothing, along with a white linen hank, that I always pack when travelling. Black is almost as useful, but is obviously darker and a touch more dramatic. Black ties are often worn with white shirts by models, salesmen and misguided movie stars. It looks striking, even glamorous from a distance, but cheap close-up. Which is why we have to mitigate the risks. First up, avoid plain woven or printed silk, and particularly satin. Navy can be used easily in any of those materials for a variety of situations, from evening to day wear; but black is not as versatile. Instead, start with a knitted silk (as shown above) or a grenadine. Both can be worn with suits, but come into their own with tonal combinations of sports jackets and trousers. In the outfit this photo comes from, the black sits well with a patterned grey jacket and charcoal trousers. That black tie could also work with my brown tweed, or possibly navy Thom Sweeney, but in both cases a navy grenadine would be better. It would, however, perfectly suit my Rubinacci donegal – which is no coincidence; both that and the Calvo jacket above have black in their weave, which is always a good first step is assessing colour combinations. In the image below, Mats at Trunk avoids the issues of a black tie with a similarly monotone outfit, made up of cream Incotex chinos and a grey Piombo jacket. He also demonstrates how formal a black tie can be – navy would not have been as smart. A blue shirt is another obvious way to mitigate the risk of a black tie, and it would have softened Mats’s look (while losing some of its impact). As you would expect, a black grenadine is more formal than a knit, but not as smart as a normal woven tie. Grenadine would have added a touch of formality to my Calvo de Mora combination above (as would replacing the silk hank with white linen) and would also have been more suited to a suit. On that note, black ties work particularly well with brown suits – reflecting the fact that black shoes work well with such dark, muddy tones as well. Sean Connery favoured the combination in Goldfinger, as did Yul Brynner. Which brings us to the last risk. A significant issue with wearing a black tie is that it can seem a little dull if another area of dress – probably the shoes – is also black. Traditionally, men have rarely worn brown ties for similar reasons. Bear this in mind, and just ensure there is enough interest going on in the rest of the outfit to compensate: a striped shirt perhaps, an unusual suiting, or an Oxford with a fetching Foster’s fade. * There are two types of grenadine tie, comprising larger and smaller textures. I generally prefer the larger, called garza grossa by the Italians that weave them, over the finer, called garza fina or piccola. The latter are, as you might expect, more formal. You can follow the discussion on How to wear a black necktie – reader question by entering your email address in the box below. You will then receive an email every time a new comment is added. These will also contain a link to a page where you can stop the alerts, and remove all of your related data from the site. I don’t like black grenadine ties or black ties in general. I think a navy grenadine is almost as formal as a black tie ( I see black ties suited only for funerals or very formal events and nothing else) but way more versatile. I’m also surprised you like the black-brown combo, which is frowned upon by a lot of people. And for a good reason I would say, I don’t like the combo myself. I would say is the same of wearing a black suit with brown shoes. I really enjoy your blog and have a style question that I am certain you will have the answer to. I am attending a reception for the King and Queen of Norway here in Sydney at the end of the month and the invitation specifies “lounge suit”. I plan on wearing a 2 button charcoal suit but am weighing up options for the shirt and tie. Either a blue/white patterned shirt with navy tie or a white shirt with navy tie. The white shirt looks very smart but a bit business like, the blue navy option looks great also. I’ll also add a pocket square – either white linen or blue/black check depending on the shirt option. I want to be respectful to protocol and not look out of place. Notwithstanding it’s our most humid month of the year the suit is a light wool. I don’t know what ties you have in your wardrobe, but I would suggest the white shirt option would be better – more formal – but perhaps try a navy tie with a small pattern or print. Thanks for this Simon, I will definitely try the combination. I have a black knitted silk tie from Charvet which I like, but is too informal for funerals and makes me look like the doorman at Prada/Gucci whenever I wear it! This post is exactly what I read your blog for – interesting ideas that I can try with my own wardrobe. Thank you. I never considered that the garza fina could be dressier than the garza grossa, but is there a situation where one would be appropriate where the other would not? I wear garza grossa ties with pretty much everything. I would love a knitted silk tie but can’t find any in longer lengths. I normally buy bespoke ties from Sam Hober or Drakes but they don’t do knitted ties. Any recommendations on this front please Simon? Rob, Drakes does do silk knit ties actually and they’re fantastic. are you familiar with meermin shoes? They promise good quality costruction and fair prices. I noticed they are having success among the usual style forums. When done correctly and in the right hands a black tie, whether knit or satin or grenadine, looks fantastic. A great summer look is a british tan suit, white shirt,and black tie. The look is very simple,but very masculine and sophisticated as well. So, gentlemen give it a try. Simon, I like your idea of a brown suit and black tie very much. Those two colors go together very well indeed. Thank you Simon for yet another practical and insightfull article. Two questions: 1) Since you brought up the brown tie what’s your take on the brown tie, white shirt, mid grey suit combination (the virtues of brown and blue are well covered this is slightly more off the chart)? 2) What would be suitable shoes to the combo Mats is wearing in your post? I am assuming that black shoes that would mirror the tie would clash with the cream chinos but would brown shoes clash with the black tie? Would suede be an option black or brown or black shoes in a informal variation like monks or split toe? Thanks. Brown ties perhaps for another post. I use to wear a knitted wool tie with end-on-end blue shirt, grey herringbone jacket, charcoal trousers and black full brogues. I think it works. A knitted black wool tie, of course. what would you recommend for a wedding (own) to pair with a navy suit, white shirt and black oxfords? I was thinking black grenadine at first, just to add some texture, but I don’t think it’s great formal-wise. Second idea was satin, although I’m not sure on the colour. I’d rather not go with anything silver as it looks a bit tacky to me, also not keen on standard wedding ties. Remember the clothes shouldn’t stand out, particularly at an event like this. Not really, white and black just doesn’t work in my opinion (or it works but it reminds me of all the bad fitted wedding suits / tacky weddings you see on a daily basis). I too am attending BespokeNYC’s wedding. I intend to arrive in my finest birthday suit, with black whole cuts and a kipper tie. In bronze. I’m sure the nice ones aren’t but I’ve seen too many of those coupled with oversized suits and massive knots to be allergic to them for life. It must just be me but out of work I will avoid a tie like the plague, horrid little restrictive things, symbols of corporate repression. Chaps, as ladies burned their bras in the 60’s we too should burn our ties….who’s with me? I kinda used to feel that way. Then I bought some nice ties and I felt differently. A wool tie provides a nice layer of warmth on the neck in Winter, they provide interest to outfits, and they distract from imperfections in both the shirt and the body behind the shirt. Take the tie of Mats’ look and you’d be distracted by the shirt folds. Murray, I think a jacket and trousers combo looks fine without a tie. Personally, I still prefer with a tie. A suit should NEVER be worn without a tie. I see hedge fund-types around Mayfair in designer brand navy suits. They all look like clones. No tie and no silk handkerchief. It’s all one big boring block of navy. For me, it needs something to add a flash of colour and personality. A tie, a handkerchief or preferably both. I see boring nerds on the London Underground in drab, shapeless grey suits with awful ties. They look miserable. To them, it’s a uniform. To me, it’s a chance to express myself. To be the person I want to be. I dislike dandies, but I like a person with character who’s dress reflects their personality. You can apply this to a punk! I respect that. If you like elegance, a tie is the icing on the cake. The finishing touch. Without it, you’re just a big dark silhouette. Boring. Thanks Simon for a real eye opener of an article. I generally avoid wearing black and I have never even thought of getting my black (grenadine) tie out for anything other than a funeral. I really like to combination with the blue linen and donegal, and might try something similar. I get a bit too emotionally attached to clothes I have worn for certain events (weddings, funerals etc) and I like the idea of taking the tie out of the wardrobe for some more pleasurable events. What types/shades of brown or blue would not work as well with a black necktie (as opposed to navy necktie)? And why (your rationale)? 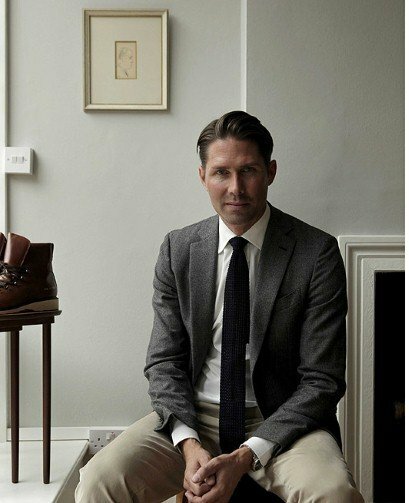 Take your above examples: navy Sweeney suit; your brown tweed. And with brown — brown tweed (not as good) vs Connery/Brynner brown suits (good)? So as test cases: navy suit, light blue shirt, black necktie, dark brown shoes — bad idea? Brown tweed/cord jacket, light blue shirt, black necktie, brown suede shoes — bad idea? Of course a dark or chocolate brown cashmere jacket,blue shirt,black or grey flannel slacks, and a black tie is an outstanding look. Whilst you are often describing separate trouser and jacket combinations, and you touch on shoe colour here in this post, but in your picture of Mats, from Trunk for example, what colour shoes should be worn? Would a black brogue harmonise with the greys, yet remain informal enough, or should brown be the default option, or even a tan, or is that too light? I’ve just seen this has been answered above. Thanks! No problem – answered again anyway! Question regarding Garza grossa grenadine ties: I recently purchased a brown garza grossa grenadine silk tie online and tried it on to see how it would hold a knot. Yet, after trying a couple knot variations i noticed several thread pulls. Indeed, i have semi-rough calloused hands. However, i never thought that the garza grossa weave would be so brittle… Is this the norm with garza grossa weaved silk ties? Any remedy? It isn’t, no. It can happen, but shouldn’t that easily. It’s hard to comment on the quality remotely, but maybe worth telling the seller? Thanks for your response! I will return it to the seller. Hi. I’ve been looking for bespoke shoe makers. You posted a blog on Cliff Roberts some time back but I’ve found it impossible to locate him. Can you pass on contact details? This is a very good article. I have learned a lot from reading this. I didn’t realise how versatile a black neck tie can be. I have got Neapolitan style bespoke blazer, color is between medium Red and Pink, something like watermelon color. Could you please advice how to wear this color blazer, what shirts, trouser, what style? This is new color for me, usually I’m wearing more classic colors, this was advice of my tailor to go with Watermelon color like fresh, summer color. I was wearing this jacket in Monte Carlo and will go to Marbella soon, but I don’t see other places where can I wear this jacket, because of color. Do you think it will work in London? In Paris I’m sure it will look strange. Thank you. With regards to the suit, would you tend towards the traditional all black? Yes, to be on the safe side, again because appropriateness is the most important thing. But if I had more choice, I’d go for a charcoal, as black is pretty terrible as a colour.